Well he is golden. Isn’t he? Or is this vintage Santa more of a bronze or brown? Whatever color he is, he’s gorgeous, another wonderful Santa from my huge personal collection. His eyes seem to bear warmth and kindness, the true spirit of the season. His smile and ruby cheeks send us on a sentimental journey of Christmas long ago. Being so, his likeness would be the perfect touch for a home decor craft project, a simple print, a holiday stocking design, an embroidery design for the truly ambitious, or to create some magnificent gift tags or graphic designs. His timeless beauty should be used, far and wide, to create other objects of lasting beauty. 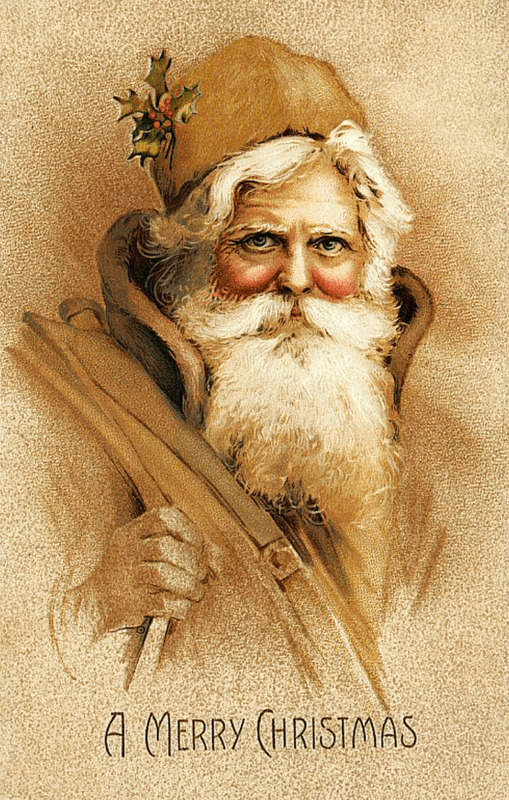 This entry was posted in Christmas Graphics and tagged antique image, Christmas clipart, Golden Father Christmas Clipart, graphics, holiday clipart, royalty-free, stock image, vintage image on October 5, 2014 by Noel Bryan.